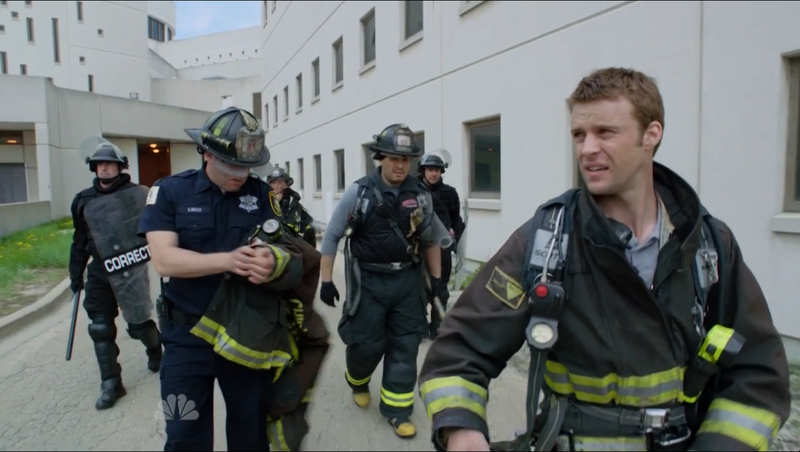 Chicago Fire is one of NBC’s breakout shows of the recent TV season and it called curtains on its first season Wednesday night where the Firehouse was called out to a fire inside a prison. The finale sent out a few curve balls starting with Shay’s attempts at getting pregnant. She announces to Dawson at the beginning of the episode that she’s a day late and she went to the doctors to have blood drawn. But thats soon resolved when, at the scene, she receives a call stating that the insemination didn’t take. At the same time Hermann is notified that his wife has gone into labour but stays inside the building to help control the fire. He does however ask Chief Boden if he can find out anything else for him. Whilst inside Hermann is used in a hostage situation by one of the inmates. He then receives news of his newest addition, a baby boy, via Casey’s radio. Making it out safely he races off to the hospital to meet his newest son. One shocker that came out of nowhere was the return of Renee. She was at one time getting it on with Lieutenant Severide, after he saved her in a traffic accident. She turns up on Severide’s front door announcing, by gesturing to her enlarged belly that she is pregnant. Unfortunately, Shay was there with Severide and her expression said it all – Jealousy. Will Severide ever want to try again to give Shay a baby now that he has one of his own on the way? Or will Shay have to go back to the Sperm Donor Registry and find another potential suitor? The strangest twist in the episode pertained to Peter “The Candidate” Mills. Boden informs him that despite of all his hard work he didn’t make it onto Squad and that it was all politics and it shouldn’t affect how he does his job. This news must have broken him because not long after he walks up to the Chicago Police Training Academy and asks for an application form. Why the change in career paths? Could he not handle working underneath Chief Boden anymore? And, will we see him appearing on the recently picked up spin-off, Chicago PD? I wanna say thanks for posting this fantastic information. Keep up this great job. I’ll subscribe to your site also. thnx!